How did they dance at the Twelfth Night Revels of Queen Elizabeth !? Read all about it. 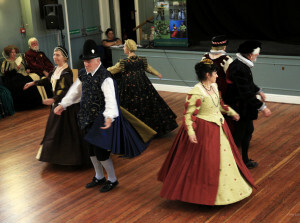 in the EDC’s Dance Through History for an overview of the world of dance at the time. Classes and Teachers can be found here and upcoming events are posted on the EDC Calendar. But Will There Be Dancing in that Tent?